Preheat the oven to 300°F. Season the pork shoulder generously with salt and pepper. In a Dutch oven over medium-high heat, warm the olive oil and sear the pork, turning, until it is well browned all over, about 10 minutes. Transfer the pork to a plate. Add the leeks and garlic to the Dutch oven and brown, stirring, 3 to 5 minutes. Return the pork to the Dutch oven and add the tomatoes, wine, anchovies, cinnamon stick, bay leaves, and rosemary. Cover the Dutch oven and place it in the oven. Cook for 1 1/2 to 2 hours, turning the pork twice during cooking (once after 45 minutes and again after an hour and a half). Raise the temperature to 425°F. 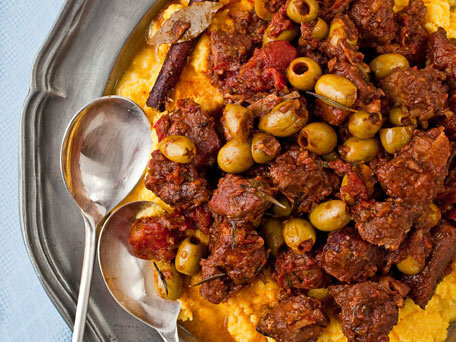 Uncover the Dutch oven and add the olives. Continue cooking, uncovered, until the liquid is reduced and the meat is very tender, about 20 minutes more. If you have made this ahead of time, let it cool so the fat has a chance to rise to the surface, then spoon it off if you like (I usually don’t bother). If you’ve made it the day before, chilling hardens the fat and makes it really easy to spoon off. Reheat if necessary and serve over polenta.